This bodes well for those of us who see the advance engine technology in our TDI (Turbo Direct Injection) making it way to more and more vehicles … and not just diesel. Many car companies are at least looking to Direct Injection technology as a way to improve power and efficiency in gasoline engines. 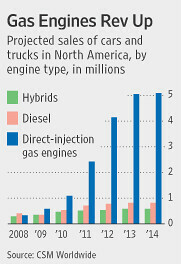 According to the forecasting firm CSM Worldwide, projected sales of vehicles using direct injection gas engines is expected to jump from 585,000 this year to 5,100,000 by 2014. Compare that to plug-in and battery-only vehicles getting all the hot press, and the estimate is that all electric niche vehicles will not even top 10% of the automotive market by the year 2020 (Berger Strategy Consultants). The forcasting chart offers and interesting look as to what technologies will see the strongest growth in the next 5 years — although I suspect some hybrid and diesel advocate will doubt the relatively flat growth projections? Direct Gasoline Injection was introduced on production aircraft during WWII, with both German (Daimler Benz) and Soviet (KB Khimavtomatika) designs. The first automotive direct injection system was developed by Bosch, and was introduced by Goliath and Gutbrod in 1952. The 1955 Mercedes-Benz 300SL, the first sports car to use fuel injection, used direct injection. The Bosch fuel injectors were placed into the bores on the cylinder wall used by the spark plugs in other Mercedes-Benz six-cylinder engines (the spark plugs were relocated to the cylinder head). Later, more mainstream applications of fuel injection favored less expensive indirect injection methods.